here it is. The latest expansion for Last Night on Earth and the first which can be used as stand-alone game. Does it fulfill my needs for more stuff to kill and more rules to torture my friends? Let’s find it out and take a close look…. Sheriff Anderson is a survivor which allows him to start the game with the “police shotgun” and the zombie card “haunted memories”. His natural leader ability allows him to spend 2 XP points to take any card from the discard pile instead of his searching round. Jake, the long term survivor starts the game with the zombie card outsider, which negates the pick up effects from buildings, but allows him to spend 2 XP instead of 3 to get a hero upgrade. As in the main game he still has his resourceful ability to draw 2 hero cards and keep one. the last survivor of woodinvale who can spend 2 XP to play a heroic event on herself from the discard pile. Still a student she has her youth ability. She still has her lucky defense ability which allows her to force a zombie to re-roll one dice but she lost her lightweight perk which means she can use guns…. finally! Ed, the lumberjack can handle 3 wounds before the final blow and his Jack of all Trades ability lets him start with one upgrade. Alice is always on the go which allows her to use her movement twice when the roll is a 1 or 2. as a student she can’t handle that much wounds but has the youth ability too. Nikki starts the game with the signal flare because she is a Pilot . Her Rescue Gear allows her to discard one item to heal a wound from herself or another hero in the same space OR to cancel a zombie card on a 3+. One of the biggest game changers is the experience system, which allows you to level up your heroes or the zombie horde. Both sides get 1 XP for every wound they cause. Heroes can choose from three update categories (melee, ranged and special) and have to spend 3 XP +1 for each upgrade they already have (for example: Sally has already 2 upgrades and want to “buy” another one which costs her 5 XP) while zombies only have to spend 3 XP for a new upgrade without additional costs for already existing upgrades (the reason for that is that most of the zombie upgrades are one-shots. Those cards must be discarded after use). The heroes also have the chance to boost there upgrades by spending additional Xps which makes there upgrades more powerful. With the addition of the fire rule gameplay gets heated up. Everytime your heroes blows somethings up (and sometimes caused by those clumsy zombies) a fire breaks out. But instead of just putting a fire token on the space, fire has an own fire phase in the zombie turn where it can spread out, getting bigger and can cause the destructions of whole groups of heroes/zombies and even whole buildings. Infection is handled differently than in the original game. Infection cards are no longer “remains in Play” which means you can’t get rid of it by playing a “remove a remains in play card” (yep… no more forum discussions about magically healing from a zombie infection). That makes it much harder to get rid of an infection and I will not spoil how you can destroy the infection 😉 . Instead the infected hero gets an infection marker which causes an additional wound on a roll of 1 or 2 everytime the hero gets hit by a zombie. If the hero gets 2 infection markers he/she instantely transforms into a hero zombie. Introduced in the Growing Hunger expansion some weapons and items are double-handed. That means that they count as 2 weapons/items which causes a shortcut in your inventory limit. Well, the hero and zombie cards are mostly tweaked versions of the original game. All of them have of course different artwork which fits the expansion. The hero cards contains a lot of new weapons (most of them are more powerful than there equivalent of the original game. Some are just a replacement. For example the pick axe is the same as the meat cleaver) but there are only two townfolks in the deck (who are really powerful when playing them in the right time). A real new addition are the double-handed items like the fuel can which gives you 3 gasoline (the card count as one and 2 additional fuel markers). The most mentionable aspect of the zombie cards is the fact that nearly all of the fight cards have an additional effect (“undead hate the living” is the only card which didn’t change at all) like forcing the hero to take an additional wound or discard an item/weapon. And what about the Upgrade Cards? Each pile of upgrade cards contains 4 cards which are twice in the deck and 2 unique upgrades. Each upgrade category benefits the player with specific advantages, for example increasing the range of guns or force the opponent to re-roll. Most of the upgrades are really helpful but are not too powerful to force the balance on one side. Anything about the new game board? Like the boards in the original game, the center piece is double sided with the town center on one side and a radio station on the other. There are a lot of new buildings on the L-shaped pieces but also some already known buildings like the police station or the high school. On some of the outer pieces are trees which avoid heroes to move diagonally. Tell us about the new scenarios! In this scenario the heroes have to find the tools and repair parts and get them to the radio station and have to defend the generator. The zombie player wins by killing 3 heroes, destroying the generator or the sun sets. put 1 explosive in one building on every L-shaped board and reach the center of the town where the detonator stands. The zombie player wins by killing 2 heroes or the sun sets. I like the new heroes. They have some interesting abilities or in case of the lumberjack a huge wound resistance. BUT: I don’t like the fact that Flying Frog is dictating me who survived the Woodinvale Incident (and none of them is one of my favorite heroes). Instead of recycling 3 heroes from the previous games, they should made a full cast of new heroes and put in some additional small cards for each previous hero which you can simply lay on your hero sheet. I really love the Experience system. It gives the game an RPG like flavour which creates a better bond between the player and the hero and gives the zombie horde an higher danger level than normal. Fire is an unpredictable danger for both sides and can get really ugly. The tweaked Infection rules clarifies some of those logic errors I had with the previous rule from the main game. Learn to survive is a good scenario to get the feel for leveling up your heroes and you should play it first before trying the other scenarios. The other scenarios are really great. None of them gives the heroes the chance to hunker down. Instead they force them to move over the complete board and think about their next move. As an expansion it is a must have! It really spices up your games and don’t really change the balance that much. Both, the zombie player and the hero players have to use more tactics than before to reach their goal. But would I recommend it as stand-alone to new players who don’t have LNOE? No. The main reason is that the difficulty is higher than in LNOE which can be frustrating in some point. And for me personally I always had the feeling to play LNOE lite but I can’t point my finger on the “why”. So… I hope this review gives you a better overview and helps you in your decision to buy it or leave it. This game is a great addition to the first Last Night on Earth game, and works as a stand alone game with lots of replay value. The way the board is constructed and the character selection means you can’t memorize or strategize too much because it can change on a dime. The game does a great job balancing the fun that is had by the players enacting the role of the survivors and those playing the zombies and despite what it can sometimes feel like there is a balance between the zombie capacity to win and the players capacity to win; the luck of either side can change on a dime. Honestly this is a great game and lots of value for money. The one issue I would say is the punctuation and wording on the cards is sometimes and ambiguous but as long as you are aware of it, house rules/interpretations can be added really easily so the cards can be sorted out easily. This is the only expansion I own for this game at the moment, so I am not sure what the others bring to the table, exactly. However, I will say that this expansion fixes just about every complaint we had about the base game. The rule book is more inclusive and there are some much appreciated additions. We have yet to mix the two games, as this game plays wonderfully all on it’s own, but it is an option. The times we do go back to the base game we always use the rule set from this expansion. 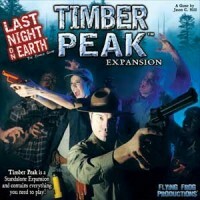 Add a Review for "Last Night on Earth: Timber Peak"